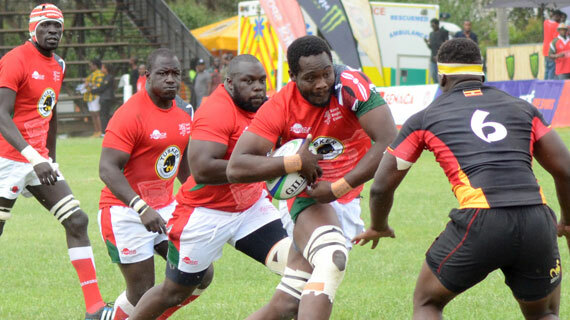 The Kenya 15s rugby team on Saturday picked their fourth consecutive win with a 38-22 victory over Uganda in Nairobi to retain the Elgon Cup title. The Kenya 15s rugby team continued with their impressive run, picking their fourth consecutive win with a 38-22 victory over Uganda in Nairobi on Saturday to retain the Elgon Cup title. The Simbas completed a sweep over the Ugandans having beaten them 34-16 in the first leg in Kampala in May. The win also ensured Kenya’s hunt for a ticket to the Rugby World Cup next year remained on course as the match also doubled up as a Rugby Africa Gold Cup match. The boys ran in five tries all which were converted and a penalty while the Ugandans ran in four tries, only one of which was converted. But once again, Ian Snook’s men had to live on the edge in the second half and only ensured victory was certain with a last gasp try. Kenya started the match positively oozing confidence with Jacob Ojee dotting down the first try down on the left and Darwin Mukidza booted home the conversion. However, the visitors had an immediate response after pushing Kenya into their own 22 and Philip Wokarach made the most of the opportunity to touch down on the right amidst flooding of bodies to tackle him down. He missed the conversion, Kenya retaining a two-point lead. But Kenya calmed the nerves of the thousands of fans who had thronged the RFUEA Ground with skipper Davis Chenge sneaking under the Ugandans to restore a healthy lead dotting down from a scrum. Mukidza stepped up for the twos making no mistake. Samson Onsomu then added the third try for the Kenyans after some good play from the Kenyans and despite a late attempt by the Ugandans to tackle. Ayange making his first appearance this season crowned off his moment with Kenya’s fourth try of the game from a brilliant move by the Kenyans off the counter. The conversion went in as Kenya went to the break 28-5 up. However, the second half was a nervous one as the Ugandans came back with revenge written all over their faces. They tackled hard and worked their socks off to win back possession. Ivan Magomu dotted diwb Uganda’s second try of the game before Wokarach converted as the gap reduced to 28-12. Kenya’s response was a three-pointer, the home boys winning a penalty inside the Ugandan 22 and selecting to go for the easy points instead of playing out. But, the Ugandans were unfazed and had their third try through Michael Wokarach who dotted down on the right. Kenya’s Andrew Chogo was then sent to the sin bin giving the Ugandans an advantage which they took use of, Philip Wokarach dotting down his second try of the game. Uganda was sniffing blood with less than 10 minutes to go and a nine point gap between them and Kenya. However, the home side managed to sneak away with a win after Moses Amusala touched down just before the buzzer and Mukidza booted home the conversion.